Idil, dosa, vada - oh my! Welcome to the flavours of South India. Idli (savoury, steamed rice cake), dosa (pancake), and vada (fried doughy fritters) are delicious snacks, native to India’s South and made from a mix of rice and lentils, accompanied with a green, white or red coconut chutney and a hot and spicy sambar (lentil curry with a mix of vegetables). These tasty dishes are part of a standard Southern breakfast, but in the rest of India and across the world, they’re a quick snack. The local dishes found in a destination are a result of cultural influences, the climate and produce grown in the region – and South India is no different. The most common ingredients are rice, coconut, and bananas. Rice is the most popular, with coconut a close second. Food is often cooked in coconut oil and many of the curries and chutneys are made from coconut, too. Bananas can add sweetness to savoury dishes or, are used in desserts. And forget about dinner plates: the traditional way of eating a meal is off a banana leaf. Any self-respecting kitchen across South India wouldn't be complete without a hefty supply of mustard seeds, peppercorns, curry leaves, chilli, and tamarind. Eyes bigger than your stomach? Not a problem in India. Sample a variety of dishes at once by ordering a thali – a curated combination of dishes served to you on a steel plate with many small bowls. Depending on where you’re eating, you’ll have a choice of non-vegetarian and vegetarian thali. The rest of the menu is pre-decided for the day. Rice, South Indian versions of roti and papad (papadum), as well as pickles, will also be included in the thali. One of the tastiest comfort foods in the South is curd rice. The dish is so delicious that the rest of India has caught on, adopted it as their own, and it can now be found across the country. While it can be slightly altered in taste, depending on the exact preparation method, curd rice is essentially made from rice, yogurt and mustard seeds with a few more spices sprinkled on top. Move over Melbourne, you may just have a competitor in the coffee game. The specialty brew of South India is not tea, but filtered coffee. Just like a hip macchiato, it packs a punch with sweetened milk often added to a strongly brewed cup. The potent combination of caffeine and sugar gives you just the right morning or, is a good way to end a meal. Although South India is considered one region, each state is distinct in its culture and flavour combinations. Here, four South India states and the classic dishes from the region. Kerala, also known as “God’s own country,” has equally divine foods to match its moniker. Located on India’s tropical Malabar Coast, it’s no surprise that seafood rules here – fresh crabs, prawns, mussels, oysters, mackerel, tuna and lobster are fresh and plentiful. If you’re not a seafood fan, look out for stew (usually made from lamb or chicken) and appam, a type of pancake made with fermented rice batter and coconut milk. Idiyappam is a common but more complicated version of appam where rice flour is pressed into vermicelli-like noodles and steamed. Keralites’ eat breakfast like a king, and their feast is puttu and kadala curry. Puttu is steamed rice in a cylindrical form with coconut shavings and kadala is a spicy black chickpea curry. Come meal time, Kerala prawn curry rice, flaky Malabar parathas (flat bread) and pazham pori (fried banana fritter) will satisfy any rumbling tummy after a day of sightseeing. 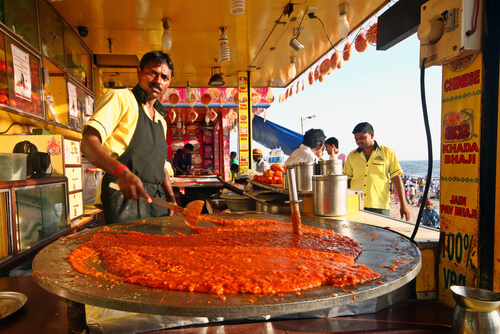 The towns of Mysore and Coorg are said to have had the greatest influence on Karnataka cuisine. 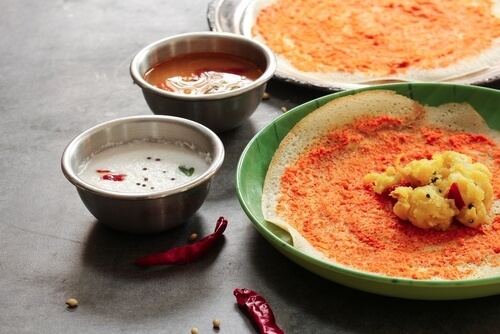 The famous Mysore Masala dosa (a dosa with a layer of red garlic chutney, spices and a potato filling) served with sambar and coconut chutney, is said to have originated here. Neer dosa is another moorish, specialty dish. Made from rice, it is soft and thin and is used as a roti of sorts alongside an accompaniment. Gassi curry is best made with seafood such as prawns, but you can also replace this with chicken. Pork is also very popular in Karnataka and is the star of the dish, coorg pandi curry – a rich, dark curry with tamarind and slightly chewy pieces of pork. After dinner, satiate your sweet tooth with haalbai, a dessert made from coconut, jaggery and rice. Other options include Mysore pak, made from sugar and chickpea flour, and rava kesari made from semolina, ghee and fruit. One of the most common dishes served in the South (although Tamil Nadu is it’s proud home) is lemon rice. The addition of fresh tangy juice gives plain white rice an edge. Chettinad cuisine is also from this region. The Chettinad masalas are extremely popular and full of flavour. They are also quite fiery on the tongue so if you order it, be prepared for the heat. The masala is made from fresh, pungent spices that are ground together and then roasted in a pan to further enhance the flavour before being added to meat or vegetables. While it is undoubtedly one of the tastiest cuisines in the South, the heat won’t be for every palate (diner, beware). Another spice-loving region is Andhra Pradesh. Try the tamarind-flavoured rice chitranna. The Andhra curries, which are known to have a kick to them, need to be eaten with plenty of rice to dial down the heat. Influenced by the Nizams and their foods served at court, the dishes are also quite rich. Besides the more typical Southern flavours, the world-renowned Hyderabadi Biryani, which was said to be concocted under the influence of Iranian and Mughlai kitchens, is a favourite found everywhere. No matter where you begin your South Indian food journey, you will find the perfect dish for you – and once you’ve found it, you’ll be hooked for life.